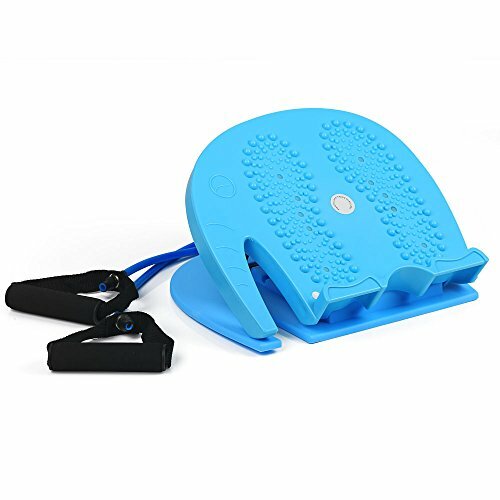 Comes with 59'' bonus resistance band for complete body workout: Genuine multi-purpose balance board, Perfect for synchronous leg, arm, neck, back and shoulder workout to increase your flexibility and strength and improve your posture. Using a slant board allows you to protect the Achilles tendon which is the strongest tendon in the body. Useful for relieving the stress around muscles which tend to ache after exercise. Preventive medicine also values slant boards to ensure that possible leg injuries are avoided. A slant board helps in the circulation of blood to the leg to prevent swellings. Ideal for all ages and fitness levels. Professional size and extra side handle for portability: Can stand with your feet shoulder width apart; Suitable for use in home, office, gym and clinics. DURABLE: ABS environmental protection material. Support weight is 330 lbs. Size is 13" (Width) x 11" (Length) x 1.6" (Height). COMFORTABLE: Can be used barefoot with foot acupressure. Easy to use: Fully assembled, ready to use out of box; Exercise guide included. A healthy exercise that can be done by anyone. Great for men, women, and seniors. It's a simple tool but effective as a stretching aid. Demonstrated health benefits: Not only helpful to stretching before/after work out, but also beneficial to the body recovery from plantar fasciitis, achilles tendon injuries, shin splints, calf strains and other foot and ankle injuries and pain. If you have any questions about this product by CLAKION, contact us by completing and submitting the form below. If you are looking for a specif part number, please include it with your message.